What’s Happening on the Farm Information Line? Tomato leaf curl in a high tunnel. Three of the most frequently asked questions on the FIL right now are about tomato leaf curl, pesticide drift, and weed identification. Robin reveals the answers in this article. First, what is the Farm Information Line? The Farm Information Line is a service provided by University of Minnesota extension to help farmers across the state find solutions to all their Ag questions. I have manned the line for three years, and find that many of the calls and emails I receive are from small, specialty crop producers who are having issues that impact their bottom line. This monthly column will review the most common questions I receive, and provide some solutions to those questions. If you have a topic you would like me to include in this column, please email me at trot0053@umn.edu, and I’ll try to get you an answer. During the month of July I had 3 top questions regarding fruit and vegetable production. 1) Why are my tomato leaves curled? Is this pesticide drift or some sort of disease? 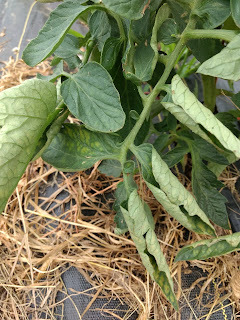 The month of July had some significantly warm weather that caused physiological leaf roll in many tomato plants across our region. Physiological leaf roll starts with upward cupping at the leaf margins followed by inward rolling of the leaves. 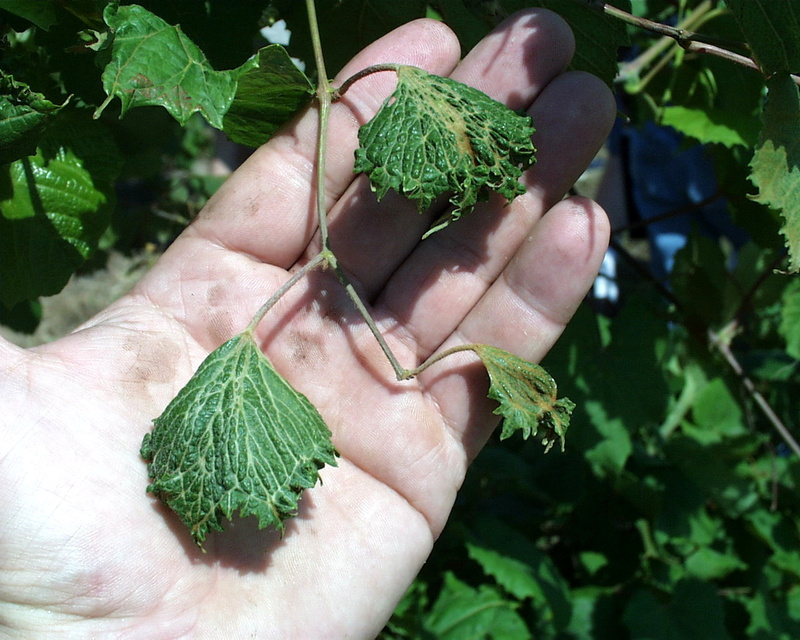 The severity of leaf roll appears to be cultivar dependent. Cultivars selected for high yield tend to be most susceptible. Indeterminate cultivars of tomato are reported to be more sensitive to this disorder than determinate cultivars. Current knowledge of tomato physiological leaf roll indicates tomato yield and fruit quality are not affected by this physiological disorder. 2) What do you do if you suspect pesticide drift has contaminated your fruit/veg production fields? 2,4-D herbicide damage on grapevine leaves. Pesticide drift can really hit your production numbers, especially if you are marketing organic or chemical free produce. “Pesticide” means a substance or mixture of substances intended to prevent, destroy, repel, or mitigate a pest, and a substance or mixture of substances intended for use as a plant regulator, defoliant, or desiccant. Complaints to the Minnesota Department of Agriculture (MDA) must be submitted in writing according to state law. If your complaint involves products containing the new dicamba formulation, i.e. Engenia, FeXapan, or XtendiMax, please use the Dicamba Misuse Complaint Form. If you would like to discuss your complaint before filing a written complaint, contact the MDA at 651-201-6333 between 8:00 AM and 4:00 PM Monday through Friday. I get many questions each week asking if there is someone who can identify a weed, and make recommendations on how to safely remove the weed from produce production beds. First, UMN Extension has an online interactive tool you can use to identify some of the most common weeds. Visit Is this Plant a Weed? to help identify your pesky problem plant. If this tool still doesn’t help, take several pictures: a close up of the leaves and how they are placed on the main stem, a photo of the whole plant, and any particularly interesting features you find on the plant in question. Email these photos to fil@gmail.com, and I or my colleague, Lacy, will get back to you as soon as possible. Clear photos are a must! For all your farming questions, contact the Farm Information Line at 1-800-232-9077. FIL hours are 8:30-12:30 M-F. If you reach our voicemail, please leave a detailed message and we will get back to you within 24 hours.